Pioneers in the industry, we offer zeera green slate veneer sheet, copper slate veneer sheet, california gold slate veneer sheet, deoli green slate veneer sheet, d galaxy slate veneer sheet and golden slate veneer sheet from India. With the assistance of skilled and dedicated professionals, we offer highly durable range of Zeera Green Slate Veneer Sheet that are highly demanded for its exceptional features and are designed with perfection. Our entire product range is valued for elegant looks and is designed with precision. These products have creative patterns. 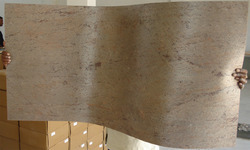 In order to carve notable position in the industry, we offer an exceptional range of Copper Slate Veneer Sheet. Our entire product range has smooth finishing and is delivered in standard sizes and grades. With the assistance of skilled and experienced professionals, we are able to deliver world-class range of products. Furthermore, we offer them with customized solutions. Backsplashes, Window Sills, Residential Flooring, Ceilings, Walls, Columns, Curved Surfaces, Furniture, Light Weight Signage, Lighting, Shower and Bath remodeling or new installations. 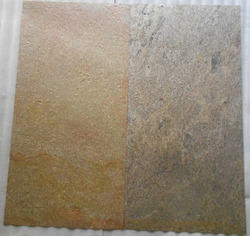 California Gold Slate Veneer Sheet is a veneer with a layer of stone 1 to 5 mm thick. Flexible stone veneers should not be confused with traditional stone veneer. Flexible stone veneers are considered a true stone veneer in the same way that wood veneers are very thin sheets of wood. It is used for both interior and exterior and especially where bending to a curved surface is required.Flexible stone veneer is made from a thin layer of stone stripped or peeled from a stone slab, rather than cutting from a solid stone or precast composite material. Leveraging on our vast industrial experience, we offer an exceptional collection of Deoli Green Slate Veneer Sheet that are easy to maintain and beautifies the surroundings. Our entire product range is quality assured and can be easily polished with desired patterns. With the assistance of experienced professions, we offer an exceptional range of products. We are counted amongst the reckoned names in the industry, offering varied range of D Galaxy Slate Veneer Sheet that are acclaimed among the clients for high quality and smooth finishing and elegant looks. Our entire product range is used for construction purposes and is delivered in standard dimensions. Furthermore, we offer them with customized solutions. Back splashes, Window Sills, Residential Flooring, Ceilings, Walls, Columns, Curved Surfaces, Furniture, Light Weight Signage, Lighting, Shower and Bath remodeling or new installations. With the advent of advanced tools and modern technologies, we offer varied range of Golden Slate Veneer Sheet that is acclaimed among the clients for elegant looks and attractive designs. We offer them in varied finishing standards and are designed with perfection. 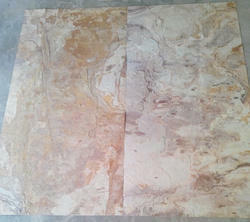 Golden Slate Veneer Sheet is finely crafted using modern tools and technologies. 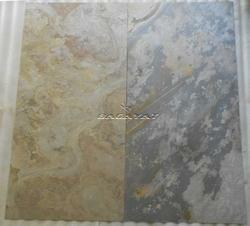 Indian Autumn Slate Veneer Sheetshould not be confused with traditional stone veneer. Flexible stone veneers are considered a true stone veneer in the same way that wood veneers are very thin sheets of wood. It is used for both interior and exterior and especially where bending to a curved surface is required.Flexible stone veneer is made from a thin layer of stone stripped or peeled from a stone slab, rather than cutting from a solid stone or precast composite material. 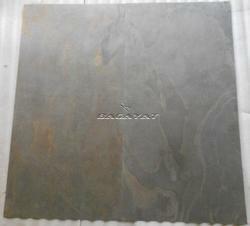 Jack Black Slate Veneer Sheet is a veneer with a layer of stone 1 to 5 mm thick. Flexible stone veneers should not be confused with traditional stone veneer. Flexible stone veneers are considered a true stone veneer in the same way that wood veneers are very thin sheets of wood. It is used for both interior and exterior and especially where bending to a curved surface is required.Flexible stone veneer is made from a thin layer of stone stripped or peeled from a stone slab, rather than cutting from a solid stone or precast composite material. We are counted amongst the reckoned names in the industry offering varied range of Kund Multicolor Slate Veneer Sheet that are delivered in varied dimensions and are designed with perfection. They are valued among the clients for their attractive looks and dimensional accuracy. 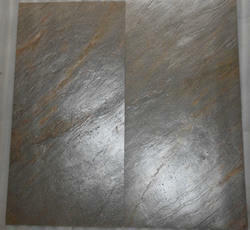 Multicolor Slate Veneer Sheet has smooth finishing and is quality assured. In order to cater diverse requirements we offer an exceptional range of Ocean Black Slate Veneer Sheet that are delivered in varied sizes and have smooth finishing. 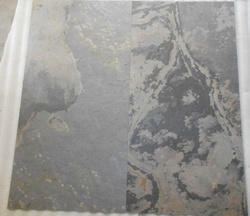 Creative collection of Silver Shine Slate Veneer Sheet is designed with perfection and beautifies the surrounding. 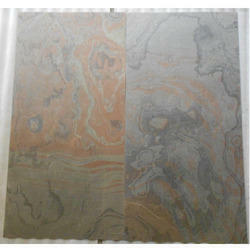 Silver Shine Slate Veneer Sheet is offered at most affordable rates. Backed by advanced tools and modern technologies, we offer an exceptional range of Ocean Green Slate Veneer Sheet that are treasured among the clients for high quality and smooth finishing. They are scratch resistant in nature and add elegant and sophisticated look to the surroundings. 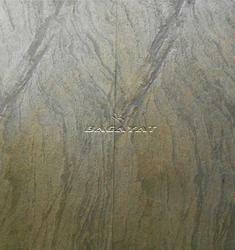 Ocean Green Slate Veneer Sheet is offered with customized solutions. 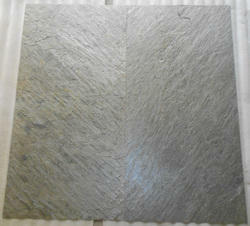 Silver Grey Slate Veneer Sheet is a veneer with a layer of stone 1 to 5 mm thick. Flexible stone veneers should not be confused with traditional stone veneer. Flexible stone veneers are considered a true stone veneer in the same way that wood veneers are very thin sheets of wood. It is used for both interior and exterior and especially where bending to a curved surface is required.Flexible stone veneer is made from a thin layer of stone stripped or peeled from a stone slab, rather than cutting from a solid stone or precast composite material. In order to cater diverse requirements we offer an exceptional range of Silver Shine Slate Veneer Sheet that are delivered in varied sizes and have smooth finishing. 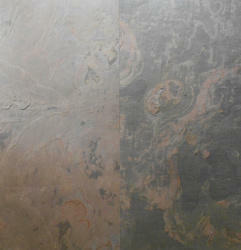 Creative collection of Silver Shine Slate Veneer Sheet is designed with perfection and beautifies the surrounding. 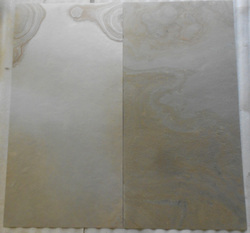 Silver Shine Slate Veneer Sheet is offered at most affordable rates. Terra Red Slate Veneer Sheet is a veneer with a layer of stone 1 to 5 mm thick. Flexible stone veneers should not be confused with traditional stone veneer. Flexible stone veneers are considered a true stone veneer in the same way that wood veneers are very thin sheets of wood. It is used for both interior and exterior and especially where bending to a curved surface is required.Flexible stone veneer is made from a thin layer of stone stripped or peeled from a stone slab, rather than cutting from a solid stone or precast composite material. Being the reckoned names in the industry, we offer an exceptional range of Yellow Slate Veneer Sheet that are processed in a hygienic environment and are delivered in varied specifications and are scratch resistant in nature. Our entire product range has smooth finishing standards and is designed with accuracy. We are supplier of Autumn Cream Slate Stone Veneer Sheets also known as Flex Stone Veneer, Slate Lite Veneer, Slim Stone Veneer & Thin Stone Veneer.Flexible stone veneer is a veneer with a layer of stone 1 to 5 mm thick. Flexible stone veneers should not be confused with traditional stone veneer. Flexible stone veneers are considered a true stone veneer in the same way that wood veneers are very thin sheets of wood. It is used for both interior and exterior and especially where bending to a curved surface is required.Flexible stone veneer is made from a thin layer of stone stripped or peeled from a stone slab, rather than cutting from a solid stone or precast composite material. Packaging Details: Packaging : 25 Sheets per Corrugated Box, 10-12 Such boxes further Packed in Sea worthy Wooden Crates. We are supplier of Forest Fire Slate Stone Veneer Sheets also known as Flex Stone Veneer, Slate Lite Veneer, Slim Stone Veneer & Thin Stone Veneer.Flexible stone veneer is a veneer with a layer of stone 1 to 5 mm thick. Flexible stone veneers should not be confused with traditional stone veneer. Flexible stone veneers are considered a true stone veneer in the same way that wood veneers are very thin sheets of wood. It is used for both interior and exterior and especially where bending to a curved surface is required.Flexible stone veneer is made from a thin layer of stone stripped or peeled from a stone slab, rather than cutting from a solid stone or precast composite material. We are supplier of Indian Autumn Rustic Slate Stone Veneer Sheets also known as Flex Stone Veneer, Slate Lite Veneer, Slim Stone Veneer & Thin Stone Veneer.Flexible stone veneer is a veneer with a layer of stone 1 to 5 mm thick. Flexible stone veneers should not be confused with traditional stone veneer. Flexible stone veneers are considered a true stone veneer in the same way that wood veneers are very thin sheets of wood. It is used for both interior and exterior and especially where bending to a curved surface is required.Flexible stone veneer is made from a thin layer of stone stripped or peeled from a stone slab, rather than cutting from a solid stone or precast composite material. We are supplier of Milky White Slate Stone Veneer Sheets also known as Flex Stone Veneer, Slate Lite Veneer, Slim Stone Veneer & Thin Stone Veneer.Flexible stone veneer is a veneer with a layer of stone 1 to 5 mm thick. Flexible stone veneers should not be confused with traditional stone veneer. Flexible stone veneers are considered a true stone veneer in the same way that wood veneers are very thin sheets of wood. It is used for both interior and exterior and especially where bending to a curved surface is required. We are supplier of Multicolor Pink Slate Stone Veneer Sheets also known as Flex Stone Veneer, Slate Lite Veneer, Slim Stone Veneer & Thin Stone Veneer.Flexible stone veneer is a veneer with a layer of stone 1 to 5 mm thick. Flexible stone veneers should not be confused with traditional stone veneer. Flexible stone veneers are considered a true stone veneer in the same way that wood veneers are very thin sheets of wood. It is used for both interior and exterior and especially where bending to a curved surface is required.Flexible stone veneer is made from a thin layer of stone stripped or peeled from a stone slab, rather than cutting from a solid stone or precast composite material.